UPDATE: This post was originally titled Gmail: Getting Rid of Remembered Addresses. I have a dear aunt who’s having trouble with those pesky remembered email addresses. Well, as luck would have it, we tried deleting individual cookies; it didn’t work. Psst. Check out my next blog for getting rid of remembered addresses. There is a time and place for deleting individual cookies. If you have trouble with a cookie-driven site or a specific site within a browser, deleting individual cookies can help the offending site function better. First, let’s talk about what cookies are and why we need them. You’ve heard of computer cookies? Excellent. What’s a cookie? 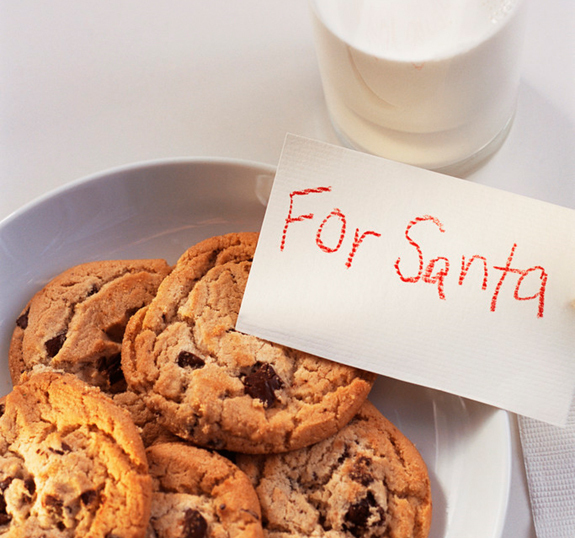 Well, it’s not the yummy kind you dunk into milk or leave out for Santa. Cookies are “directions” downloaded into your computer memory by websites. These directions include telling your web browser where you left off on a webpage, your login information, and what ads you’ll benefit from most. Yep, that’s why ads for something you just searched on Walmart’s website pop up when you’re on a completely unrelated site. I call that the cookie curse. The cookie blessing comes when you check your Facebook page without having to log in each time. Why do we need them? Web servers/sites have no memory. To remember who we are and what we like, cookies are kept on our computers. Now that you know what cookies do, let’s talk about clearing them. What? You’ve heard about clearing cookies, too. See, you’re computer savvy and you didn’t even know it. Say a particular website is not cooperating — it’s freezing or lagging — it may help to clear cookies. The problem with clearing all cookies is that while this does what you want, it also gets rid of all things that aren’t a problem: logins, passwords, and other helpful data. But never fear, there’s a way to delete specific cookies without deleting them all. 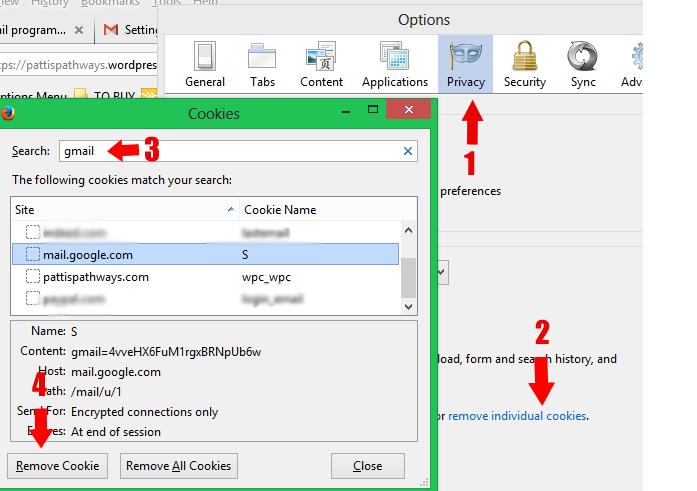 Clearing cookies is done through your computer’s browser. As far as browsers go, they’re like jeans — each person has their favorite. Levi 501’s anyone? The best-known browsers are Internet Explorer, Google Chrome, and Mozilla’s Firefox. If you have a Mac, you probably use Safari. Yes, there are other browsers available, such as Opera, but we’re talking about the most used today. No hate mail, please. I’ve listed the how-to’s by browser. You’re welcome to read them all or scroll down to your specific browser. I’m using Gmail as an example, but you can do this for any problem site: Washington Post, Ebay, Amazon, etc. TIP: Don’t save passwords for sites with financial consequences (i.e. Ebay, Amazon, your bank, your broker, and many others). Yes, you have to enter it each time, but trust me, if your computer is ever hacked, you’ll be happy you didn’t. So when your browser asks if you want to save a password at a site that has information on your money, say “Never for this site”. See my post Creating the Safest Passwords for help. 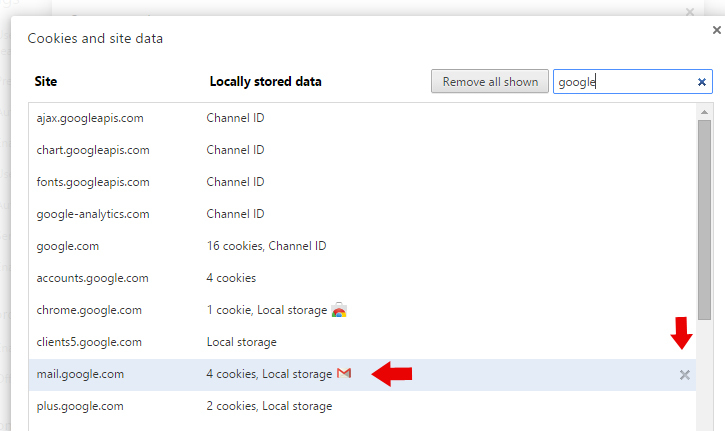 1) Click the Privacy tab, 2) click remove Individual cookies, 3) write “gmail” in the search box and highlight the first google mail cookie that appears, then 4) click Remove Cookie. The highlight will now be on the next cookie so if it’s gmail, delete it also. When you’re through with all the gmail cookies, close the window. 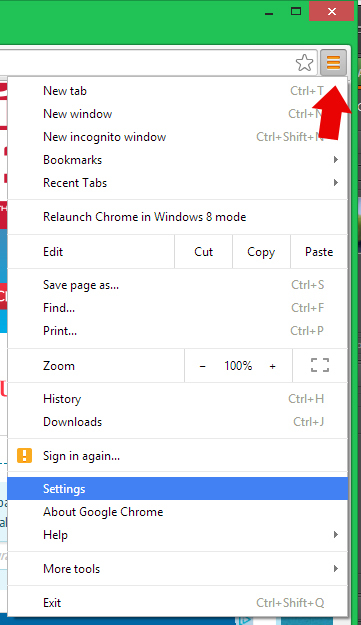 With Chrome, you also have the three-line Menu icon in the top right. 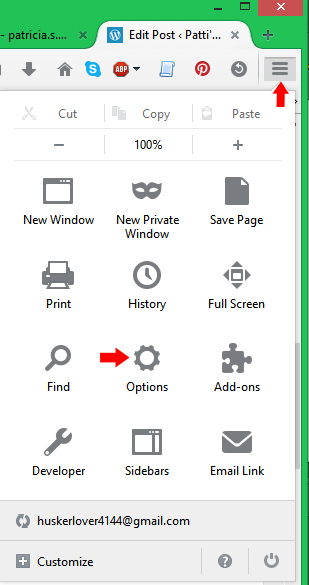 Click it then go to Settings towards the bottom of the dropdown menu. Now you’ve opened a window that looks like the one below…kind of. You still need to scroll to the bottom and click on Show Advanced Settings. Don’t be afraid; you won’t mess anything up, it just makes the Settings list longer. Scroll down to the Privacy area and click Content settings. Type “google” in the search area and find mail.google.com. Press the “x” to delete only that cookie. I must confess, I left IE until last of the PC browsers because I dreaded the research. To be honest, it’s the easiest and quickest of them all. Thanks, Microsoft. Open the website you wish to delete cookies from; mine is Gmail. Then open Developers Tools (F12), click Cache, then Clear cookies for domain. I don’t have a Mac, but since I mentioned it above, I researched how to remove individual cookies. Open your Safari browser. In the top farthest left corner it says Safari. 1) Click Safari, 2) chose Preferences from the dropdown menu, and then — depending on your version — 3) click either Privacy or Security tab. 4) Click Details or Show Cookies. 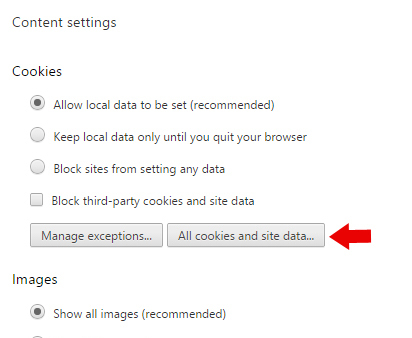 5) Choose the website you wish to remove cookies from, and click 6) Remove. Click Done when you’re through. Now you are a cookie aficionado. Well, maybe not quite, but you still know more than you did when you started reading this blog post. A recommendation? Sure. I have a good one. I use a program called CCleaner by Piriform. It’s Free. It scans your computer for things you don’t need (cookies, surfing history, temporary internet files, Windows log files, recycle bin contents, and more). If your computer is slowing down, it could be due to miscellaneous saved stuff. Now go have a cup of tea or something and relax. You’ve used a lot of gray matter today. This entry was posted in Computer Technology and tagged clearing browser cookies, clearing individual cookies, Computer cookies, Gmail, Patti's Pathways, pattispathways on November 19, 2014 by Patti.